#1,817 Goulet Day (Ben’s 10 Year Edition). – Laurel Mercantile Co.
Now reading: #1,817 Goulet Day (Ben’s 10 Year Edition). #1,817 Goulet Day (Ben’s 10 Year Edition). Continued from Ben’s guest blog yesterday, he’ll tell you about day 2 of the 6 days of our courtship from way back in 2004. I’m crushing on him all over again. To read my (fangirl) side of the story written in 2010, click here. So, Chase, Barron, Austin Smith, me, and a few other guys all took Miss Green’s psychology class the fall semester of 2004. It was a good elective and we heard she was a cool teacher, and we thought, “Why not?” Mrs. Green would use all sorts of resources for teaching. One of these resources was a video about the effects of illegal drugs on the mind. We watched a woman who was being interrogated by a police officer. She had been arrested for doing something illegal. She kept explaining to the officer, “They’re after me.” He would try to ignore it and continue with the standard questions, but eventually, she would tell him, “The casheestees. They’re after me.” I’ve never found the video again, but I found this Law & Order clip that, oddly, references the same sort of hallucinations. After not getting much sleep, wondering if the girl with the short, blonde hair was thinking about me, I decided to text her early that morning. It needed to be something strong, weird and random. “What’s up?” would have been completely lame, “I was thinking about you all night” would’ve really been awkward, “Did you sleep okay?” is way too sweet, but “They’re after me.” was just weird enough and just random enough to do the job. She woke up, read the message, and called me—her voice still scratchy with sleep. I went into the whole speil about the video in psychology class. It probably only confused her more, but we were talking and I called that success. I probably asked her if she’d had any dreams about me. She probably had. Though, she never would’ve told me. I walked over to my class that day happy has a hippo. It was a cold morning, which meant minimal December sweat. I took my usual position outside the humanities building between classes, and eventually, she walked up. I still wasn’t sure how to act around her. I mean, my usual charm had gotten me nowhere for months, so we talked a bit and I said that I would see her at the photo shoot at 2:00. I think I was aiming for cool, though she tells me it came off as totally neutral, which in retrospect probably wasn’t a great move. 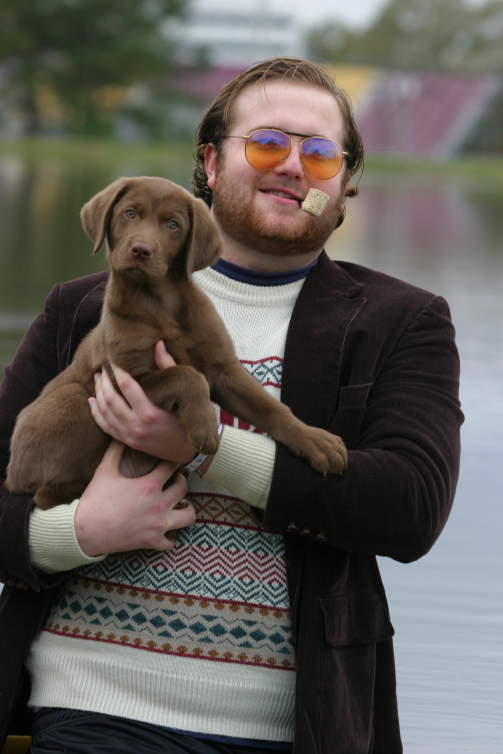 After lunch, I went and changed into my Goulet clothes, which now included gym shorts, because I’d be waist high in muddy water, so it didn’t matter that my shorts didn’t match the brown corduroy blazer. 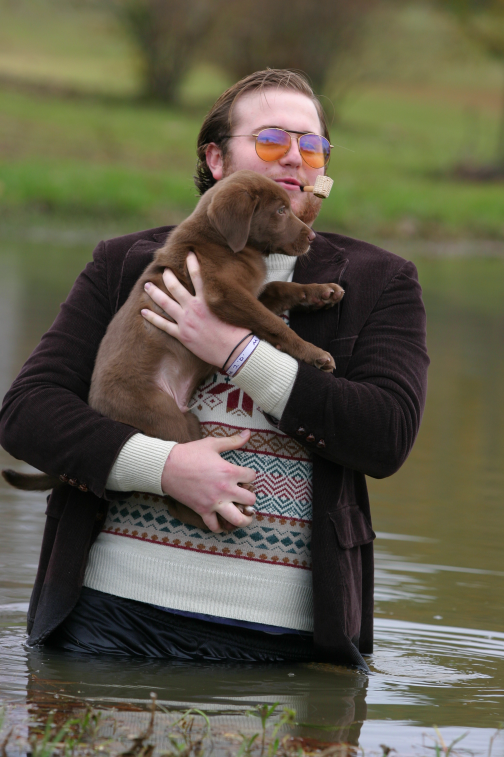 My hair was slicked over in a hard part, and we all started for the yearbook room, bringing along Jordan, a chocolate brown retriever puppy Chase had just gotten for his girlfriend. My usual crew was in tow for the event. I had to answer some questions for the spread, so Erin gave those to me for me to be thinking about. I used to do this thing with girls, I would take them by the cheeks or chin or whatever, and I’d lean in as if I were Clark Gable about to kiss Scarlet passionately on the lips. Sometimes girls would turn away in shock, flushed with embarrassment, sometimes they wouldn’t, sometimes I’d go ahead and lay one on her. Erin didn’t pull away. I said, “You were going to kiss me.” She claimed to be oblivious. I didn’t kiss her then, but this was the first time that I knew I would sooner or later. We left the yearbook room headed for the lake. Walking down the hallway of the student media center with all our company, I dropped my arm around her shoulders and flirted with she and the other yearbook girls on our way out of the building. 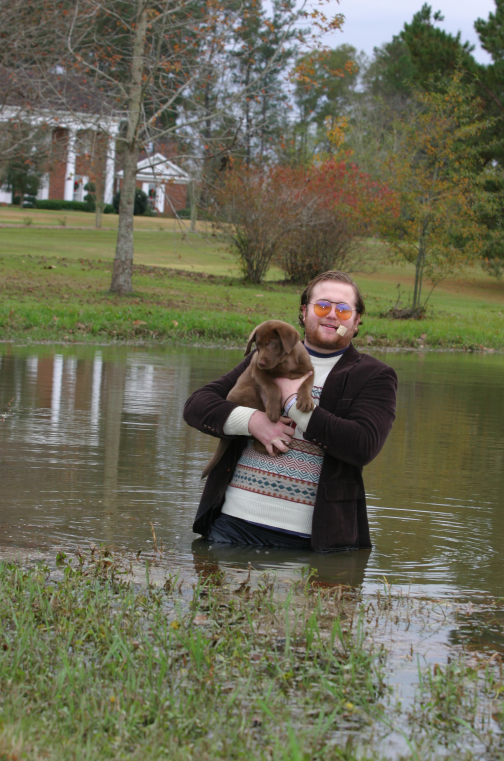 I made Will Ferrell jokes, pretended to smoke my pipe, and started into the pond with my trusty hound. The water was freezing, and my scraped knees sank into the mud. The dog started to panic. Matt took the pictures quickly, and I was out of the lake in no time. I rode hanging onto the side of Matt’s silver SUV back to the student union because I didn’t want to get his car dirty and because I thought it would look cool for the girls—let’s be honest. Once in the yearbook room, Erin started editing the photos. The crowd had dwindled some, and it continued to dwindle as watching Erin edit pictures of me isn’t as interesting as you might imagine. I sat there, with muddy, cold wet legs, waiting for Erin to finish. I wasn’t ready to be away from her. Then I remembered. You know, it was funny at the time, but those brakes were smooth as velvet. That little car had no problem stopping, and there was zero noise from the brakes. I gave her a hard time about that. “You were just wanting to call me last night.” I winked, without a bit of irony. She had this burned mix CD in her car that had her hand writing scrawled across it in purple Sharpie: Drive Safely. It was a random mix of songs that I had never heard of. “Kate,” a Ben Folds Five song about a musical girl who was different from every other one he’d ever known and absolutely all he wanted in life was to simply meet her (timely), there was some Modest Mouse (namely, this song), that great song by Keane, and then there was “Delicate” by Damien Rice. Oh how I loved driving her car, catching her smiling at me, listening to her sweet sounding voice saying things, anything, with the backdrop of the lyrics and violins of “Delicate.” It’s the one song that will break and expand my heart every time I hear it, and I will think of her and that week we met. It’s our song. It will always be. We rode around the backroads, past fields and woods, and eventually ended up at the weird cafe right off of campus with Kristen, Erin’s roommate, and Sydney, a girl who once stole my favorite Jones football hoodie and never returned it. I ordered a slice of cheesecake and sat there listening to these girls talk, sharing the slice with Erin, grinning at her. The girl with the short, blonde hair and the lips. Those big, peach colored lips. I got the feeling that Kristen and Sydney couldn’t understand the two of us being there together. Afterward, she dropped me off at my house. I showered and went to the cafeteria, she went back to her dorm to work on her oil paintings for finals. I would normally be the first one in line at dinner, and the last one to leave, but I left the cafeteria early. I just didn’t feel like socializing that night. I wanted to sit in her car and listen to music and talk about plans after Jones. After Jones? This was something I hadn’t really thought about until now. Suddenly, I was thinking about law school, history, politics. Walking across campus, thinking about this, I decided I needed to call her. She was pulling out of her dorm headed to Sonic and I convinced her to pick me up. While we sat there in her car, I watched her eat mozzerella sticks, not knowing that this would become a special treat that we would share until we were old enough to worry about my heart. We listened to that CD over and over and over. Kate. Delicate. Float On. Somewhere Only We Know. “Sorry y’all. I’m not feeling it tonight.” Words I had never said in my life. I was usually the one pushing for New Orleans, for the all-nighter, for the girls and the adventure. But I really, honestly didn’t want to go. I wanted to sit in this little blue Bug and talk with this girl. The Girl.We sat there for a little while, and decided we needed to get back to campus. This turned into sitting in my driveway talking for a few more hours. It was midnight. Curfew. She lived in New Wayne Hall. She HAD to go to her dorm by 12:15 am or she’d be locked out for the night. I waited a respectable 9 minutes before calling her. I wasn’t ready to say goodnight. We talked all night, until 5:00 am, without a single awkward silence. I was so interested in every word she had to say, and she seemed so interested in what I had to say. I never wanted that conversation to end. #1,818 Our First Date (Ben’s 10 Year Edition). #1,816 Two Arms, Please (Ben’s 10 Year Edition).